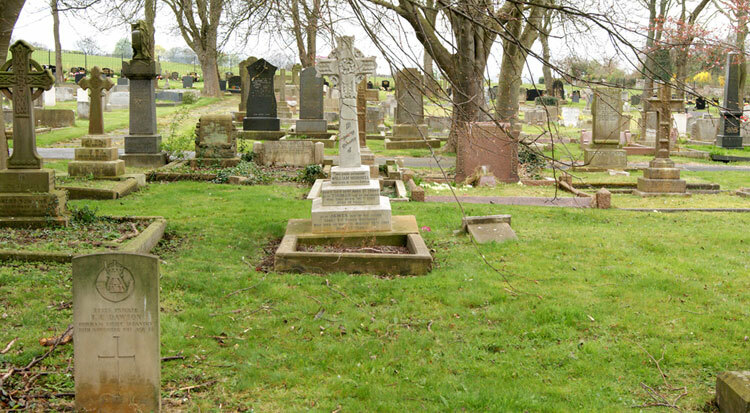 Boldon Cemetery, South Tyneside, contains 28 burials from both the First and Second World Wars. We are extremely grateful to Norman Cummings (<norman_cummings@hotmail.co.uk>) for providing the photograph of the headstone and of the cemetery. Serjeant James Walker Murrell, 13817. 7th Batallion the Yorkshire Rgiment. Died at home 6 April 1917. Aged 27. Very curiously, the Commonwealth War Graves record shows the date of death as 6 April 1917, but the headstone records the date of death as 26 March 1917. Serjeant James Walker Murrell's Service Record survives. 1 He was attested on 31 August 1914. 2 He was recorded as being severely wounded and admitted to King George's Hospital, Stanford Bridge, on 14 March 1916. 3 He was discharged as being unfit for duty 2 months later. James Walker Murrell's Service Record does not provide his date of death.